Amidst adjusting to this crazy life that is a mommy to a newborn and a two year old (did I mention the terrible two's are real and scare me more than American Horror Story? 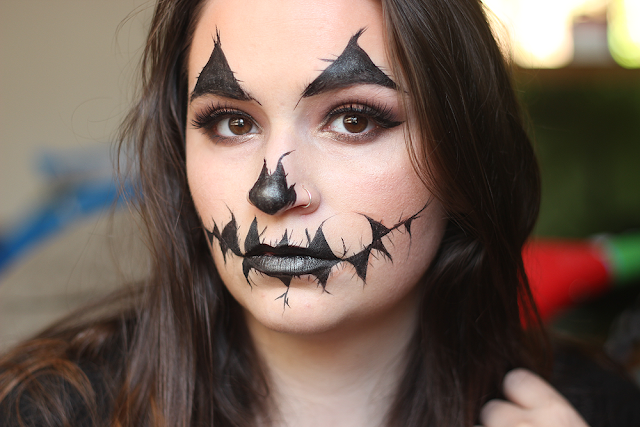 ), there was no way I was missing out on Halloween looks, even if it's just this one. Halloween is my absolute favorite holiday, if you didn't know! 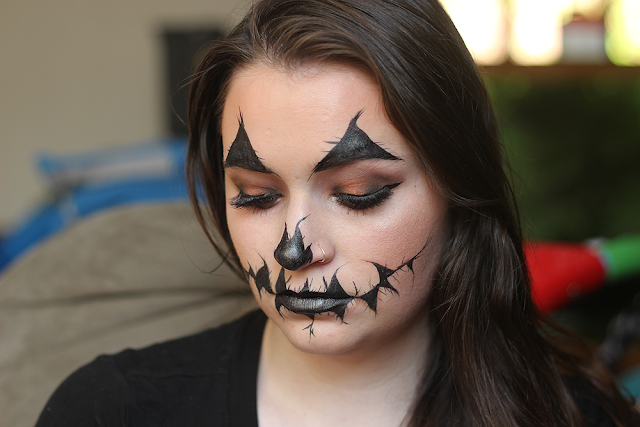 I'm all about that pumpkin life and decided to take that literally with this look I call "Creepy Jack O'Lantern". The originality is just flowin', guys. Face - So I started out with the tarte Rainforest of the Sea Water Foundation as my foundation. I hadn't used this foundation in forever. Still totally smells like paint thinner. Whhhhhhy?! It goes away within a few seconds but still. So weird. For concealer, I used It Cosmetics CC+ Concealer in fair and then set that with Laura Mercier Brightening Powder. For the "triangles" on my eyebrows, I used Eddie Funkhouser Ultra Definition Eye Lining Stylus. I made the triangles pretty mismatching because who makes perfect eyes when they're carving their pumpkins? Not this girl. I went back in with a black shadow to set everything. Same with the nose. 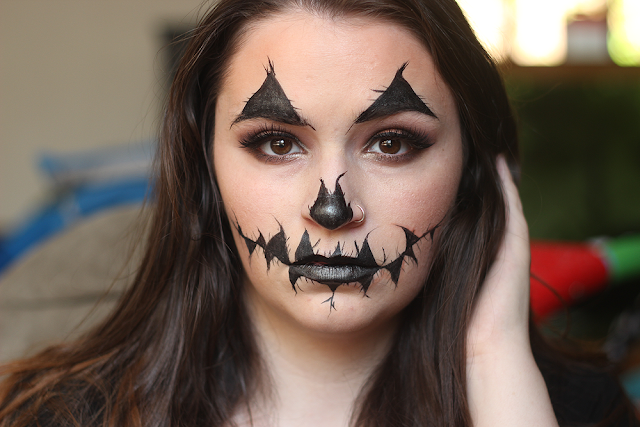 I kind of went for a skull look instead of the typical triangle and then flicked the edges to create an "un-done", creepy look. Eyes - As always, I set up a base with the MAC Paint Pot in Painterly. I like to use this to cancel out any veins on my eyes and basically start on a clean base. After that, I started to create a halo eye using Black Metal mixed with Vox from the Kat Von D Mi Vida Loca Remix Palette. Then a took Vox and applied that in the crease and blended everything together, making sure to leave the middle of the lid as bare as possible. Once that's all blended, I took Harpsichord and patted that on the middle of the lid. I then lightly blended the edges into Vox/Black Metal so it wasn't so harsh. For the cat eye, I used Eddie Funkhouser Ultra Definition Eye Lining Stylus and then applied House of Lashes in Boudoir. Lips - Lastly, for the lips, I used Eddie Funkhouser Ultra Definition Eye Lining Stylus and traced out funky triangles all along my lips and outwards. Again, the messier and misshapen, the better! I went and colored them in with the same eyeliner but you take a black lipstick and do the same. I also flicked the sides out along the triangles to give a creepier feel to them. First off, high five for not having to do our brows with this, right? Yay! But seriously. What do you think?